Mesh Upper – Provides a breathable environment, keeping the wearer cool and dry. Synthetic Overlays – For added support and secures the foot tightly onto the shoes. Abzorb – Combination of midsole materials that offer superb cushioning and comfort. Blown Rubber – Durable outsole material. T-Beam Support – Moves the foot efficiently though the gait cycle. 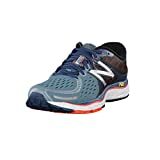 New Balance M1260v6 Running Shoes The 1260v6 is a serious game changer for overpronators, delivering premium stability and superb cushioning without sacrificing style. For this new version, we’ve maintained the support you need while upping the cushioning and upgrading to even better materials. On long runs or short runs, this men’s running shoe provides support to moderate overpronators and takes comfort to the next level. New Balance M1260v6 Running Shoes Breathable Mesh Upper The New Balance M1260v6 Running Shoes is made with a superbly breathable mesh which allows cold air to flow into the shoe at the same time as letting warm air to be released, keeping the inside of the shoe as cool and dry as possible for a comfortable fit and feel. Synthetic overlays offer a more supportive fit around the foot for a secure fit and feel all run long. Dual Density Midsole The midsole is made from a superbly cushioned and durable midsole material which provides an extensive amount of shock absorption to keep the foot comfortable as well as helping to prevent pain and injury. ABzorb cushioning material (which is a combination of N2 and REVlite) which offers excellent cushioning under the foot with every step you take. T-Beam Outsole Blown rubber has been used to construct the outsole which is superbly durable and offers high-quality grip to keep you confident on your feet. A T-Beam support runs along the outsole to help keep the foot stable as well as helping the foot move naturally and effectively through the gait cycle.